The film takes place after the events of Rogue Nation, when a new shadowy group called the Apostles have formed after the fallout of Solomon Lane’s (Sean Harris) failure to establish his Syndicate. The group seeks to obtain weapons-grade plutonium, which they will use to bring peace on earth. For they believe, “the greater the suffering, the greater the peace.” So Ethan brings his usual crew Benji (Simon Pegg), Luther (Ving Rhames), and Alan Hunley (Alec Baldwin) to obtain the bombs before the Apostles do. However, their mission does not go as they would have liked, and as a result, the plutonium has fallen into new hands. With IMF’s reputation ruined, the CIA believes that the group cannot retrieve the bombs without their help. Plus, they are now questioning Ethan’s motives and loyalties. So Erica Sloane (Angela Bassett) sends in her top agent, August Walker (Henry Cavill) to assist in bringing the asset back. But Walker’s methods prove to be too radical for Ethan, whose style is more covert and stealthy when compared to Walker’s brazen methods. However, when the mission grows more complicated, the two will have to put their differences aside to get the plutonium before it falls into the wrong hands. If there is one thing these Mission: Impossible films are great at it’s delivering highly entertaining material on a constant basis. The film is anything but subtle. But it’s not a collection of disorienting noise either. Fallout moves with precision and accuracy. But it also hits you hard whenever it deems it necessary. Its pacing is beautiful, with the film cutting to and from different points of view, but never loses an ounce of that momentum as it hurls its way to the next scene like a motorcycle going at it at full throttle. Once again, the film is a globe-trotting espionage thriller that uses each location to its fullest potential. Each location is a character in and of itself. It doesn’t matter if it is in the ground or in the air. Just as you thought the stakes couldn’t be any higher, the film takes it to a whole new level. One scene, which is a one-shot take, sees Ethan and August do a halo jump during a storm. But to make sure that it’s not just another jump, writer and director Christopher McQuarrie adds a bit more excitement into the scene by throwing in some danger and making it a race against time before the both of them hit the ground. And it is just as heart-stopping on the ground as it is in the air. Watching Ethan zip through opposing Paris traffic in the busy circle around the Arch of Triumph to escape his pursuers is nothing short of an exhilarating tension filled adrenaline rush. But no one location is the same. As we can see when Ethan takes another pursuit on foot through London having to rely on Benji guiding him to his target from a distance. It’s not any less exciting, in fact, it provides a different kind of excitement as Ethan as to adapt to the changes as he goes from the foot top to the streets, while having to depend on Benji as a GPS. And that may present some problems that provide some unexpected hilarious moments – like running through a church service and jumping out a window. That doesn’t even begin to describe how far Cruise will go to make everything feel as authentic as possible. The actor has been performing a good majority of his own stunts throughout the course of this franchise. Which includes sliding himself across world’s tallest tower (the Burj Khalifa in Dubai) in Ghost Protocol, clinging on for dear life alongside the outside of an airborne plane in Rogue Nation, and climbing a rope while a helicopter is in midair in this film. It’s probably best not to question why he does the things he does in this, because in the end, you will get something very exciting as your answer. But all of that excitement doesn’t just come from the stunts. The fight sequences are well-choreographed fisticuffs. Each blow is more hard-hitting than the next. You can almost feel their pain as Ethan and August throw their opponents through walls and mirrors. The bathroom sequence involving the two fighting another spy is well worth the price of admission. It’s that kind of well-balanced pacing that separates the Mission: Impossible films from any of the other action blockbusters. It’s not trying to be like James Bond with the espionage material or as absurd with the action as a Fast and Furious film. No, Fallout builds upon the foundation that was laid out by its predecessors, and uses what has made the franchise great: relentless action that holds on and never lets go. In fact, the film feels more like The Dark Knight and Mad Max: Fury Road in terms of structure and pacing. But even big cities don’t get the biggest action. The final third act takes place in a small village of Kasmir, where you have to love the film’s sense of irony. It’s almost scary that it could lead up to that moment and still have a few surprises waiting in the wings. 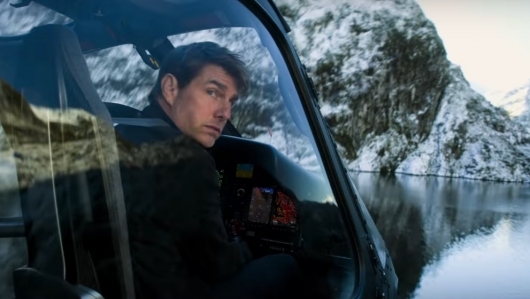 Even in its 20-year run, the franchise has found new ways to carve out unseen facets of Ethan Hunt. Fallout explores a more vulnerable Hunt, who cares just as much about one life as he does millions. While that may be seen as a weakness to some, to others that is his greatest strength. And the supporting cast is just as great, even though their character exploration has been done more times than we can count. Pegg and Rhames provide some very nice banter moments, while also getting their own moments to shine. The new additions of Cavill, who gives the film the right amount of muscle, and the newest femme fatale White Widow (Vanessa Kirby) adds a bit of sexiness. The White Widow is not just any piece of eye candy. She’s a ruthless arms dealer using good will philanthropy as a ruse. And don’t expect her to be just a pretty face. Mission: Impossible – Fallout is everything you could ever ask for in a sequel and a summer blockbuster. It has some of the best set pieces to date and that perfect balance of suspense and comedy. If there was any question that the franchise is starting to show its age or run out of gas, Fallout puts any of those doubts to rest. It is entertaining from beginning to end. And let’s face it, it’s not a question of whether or not the franchise can raise the bar with their stunts and action sequences, it’s how much higher they will put it. Because at this point, the Mission: Impossible franchise is the gold standard when it comes to action films.